Disaster Recovery as a Service – Why it’s Imperative for your Business! 24 Jun Disaster Recovery as a Service – Why it’s Imperative for your Business! Catastrophes aren’t reserved only for the real world. Mishaps online have the potential to create disastrous consequences both for enterprises as well as the market to which they cater. Cyber Attacks, Data Loss, Security Breaches have real-world impact and the risk of losing sensitive information that has the power to shake governmental and economic foundations is too great. Data and Applications are the two pillars of any Business running their operations on cloud storage and ensuring that any accidents do not directly impact Business Continuity is vital for modern day businesses. Disaster Recovery is a system where companies have a plan-of-action in place to quickly recover critical processes in the event of human errors, cybercrime, or accidents. Disaster Recovery as a Service (DRaaS) is gaining wide popularity in the UAE with more small and medium-sized enterprises choosing from Disaster Recovery Providers in UAE to protect their Business from threats online. Is Disaster Recovery for you? If you are a cloud-based organization in the UAE with major processes and sensitive data stored on cloud servers, you should consider having an efficient Disaster Recovery Plan from Disaster Recovery providers in Dubai for responding to untoward incidents. Disaster Recovery involves planning in advance for prospective loss or theft of business-critical data and applications and arriving at a series of steps to mitigate damage and resume operations as quickly as possible. A Disaster Recovery Plan generally includes Risk Assessment, Prioritizing Operations, arriving at suitable recovery strategies, Data Organization, and Testing. It is comprised of comprehensive solutions for handling Incidents and Occupant Emergencies, and for the resumption of Business with less causalities. DRaaS is a highly feasible recovery method when compared to traditional data recovery since there are no secondary backup and recovery sites involved that require high data center maintenance, electricity and internet, server and storage, and travel or staff pay-outs. DRaaS from cloud backup solutions Dubai involves creation and maintenance of ready-to-run virtual clones of integral applications and processes. Infrastructure used in DRaaS is virtual, vast, and does not involve expenditure for licenses, hardware, etc. In DRaaS from Backup Providers in Dubai, a virtual data center is permanently rigged as an extension of your business network, ready to get you back online should any setbacks occur. Recovery Time in the event of disasters for DRaaS spans between 1 to 4 hours resulting in a short duration of the disruption. In older disaster recovery methods, businesses had to wait for months for hardware installations and tests to be complete but with DRaaS, companies who have succumbed to cloud disasters can quickly come back up online with little to no loss of business. DRaaS from Cloud Solutions Provider Dubai reduces the management complexity involved in traditional data recovery and backup since the service provider wholly manages all aspects. It is an inclusive service where the service provider enters into a Service Level Agreement with an enterprise to provide data recovery within a specified time frame. The service provider performs all tasks pertaining to recovery including Testing, Monitoring, Reporting, and Capacity Management. If you’ve chosen a good Cloud Recovery Service Dubai, you can rest assured that a very secure disaster recovery plan will be rolled out for your business. 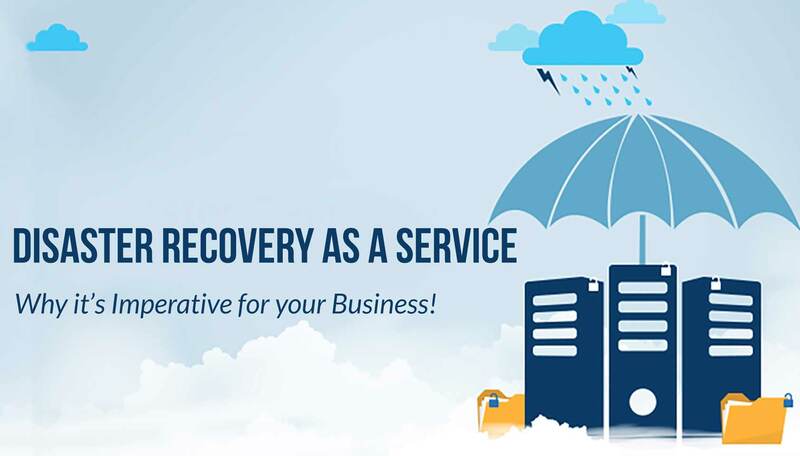 There is less confusion and smooth failover when you have entrusted recovery to a DRaaS Service Provider from Cloud Disaster Recovery Solutions UAE. Your DRaaS SP will be responsible for ensuring that your production and recovery sites are running smoothly. DRaaS from Cloud Service Providers in UAE is highly recommended in the present times when the digital world is plagued with new and dangerous threats like Ransomware and Zero-Day. Protect your Business and your Data from being corrupt or permanently destroyed by choosing from Disaster Recovery Solutions Dubai. By implementing DRaaS at the right time, you are protecting the reputation of your organization from coming in harm’s way in the future. Choose from the best Cloud Disaster Recovery Solutions UAE and bring convenience and peace-of-mind to the fore. Instead of burdening your resources with DIY data recovery, choose DRaaS and protect all your servers from unscrupulous elements prowling the web. Going for CCTV Security System for your Business? Here are some valuable tips!